When you consider how many hours you spend at work, it makes sense to try to achieve greater wellbeing at work. If your job involves a lot of seated, screen-based work, it is especially important to look after your physical health. 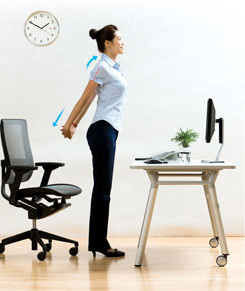 Sitting for long periods at a workstation that is not set up correctly for you can lead to several health problems including pain and discomfort, musculo-skeletal disorders, eye strain and stress. Here are some tips on how you can increase your wellbeing at work. Gently pull your head down to the right using your right hand until you can feel the stretch in your left neck muscles. Hold for 10 seconds. Then stretch your head to the left with your left hand. Clasp your hands behind your back and pull your shoulders down firmly. Hold for at least 10 seconds. This stretch is great for releasing tension in your neck and shoulders. Interlace your fingers, palms outward, and straighten your arms in front of you. Hold for 10 seconds and repeat 2-3 times. Look up and away from the screen. Focus on a distant object (more than 10 metres away). E.g. look out of the window at a nearby building or at a picture on a far wall. Shift your vision back to your monitor, and refocus. Do this several times each day for your visual health. Short and longer work breaks are both beneficial. 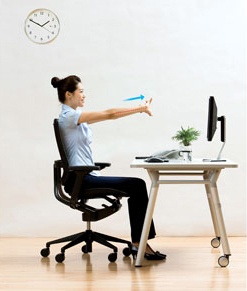 ‘Micro-breaks’ are 15 to 30-second breaks taken every 20-30 minutes during the workday. 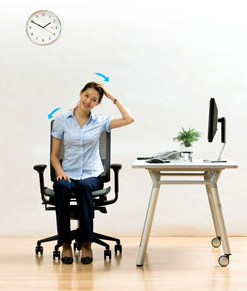 They enable you to quickly reduce muscle tension. Every 20-30 minutes while you’re working at your keyboard, drop your hands into your lap and take one or two deep breaths. Let your shoulders, arms and hands relax. After a few seconds, bring your hands back to the keyboard or mouse and continue working. Longer work breaks can include taking a trip to the printer or to get a glass of water; or walking to a colleague’s desk to discuss work issues, instead of emailing them. It is generally recommended that you drink at least 3% of your body weight in water each day – around two litres. (The best way to tell if you are drinking enough water is if your urine is pale in colour.) Working in an air-conditioned office around electrical devices such as computers can also be dehydrating, especially for your skin. Keep a water bottle on your desk, to encourage you to stay hydrated during work hours. Getting up and walking around is the best exercise you can get to provide a break from sitting, concentrating and using your upper body muscles. Try getting up around every 30 minutes at work. 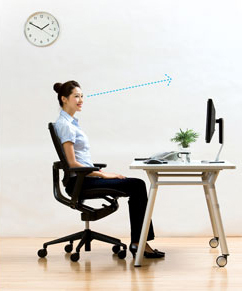 Stand up then kneel down to access low files instead of twisting your spine to access them from a seated position. Even getting up for a minute to pick up papers from the printer or to get some water gives your body some exercise. Don’t forget to take a longer walk at lunchtime!